Greetings again from the darkness. The expected cringes and groans never fully surfaced as the modernized re-boot of Paul Verhoeven’s 1987 classic unfolded on the screen. Sure, I wish Peter Weller made even a cameo appearance, and yes, I missed the charm, humor and satire that has allowed the original to remain relevant; but, director Jose Padilha reimagines the story, sticks to PG-13 action, and incorporates the video game look favored by today’s filmgoers. The result is an adequate action movie with a Dr Frankenstein twist, a dash of questionable technological morality, topped with the always evil corporate conglomerate. The opening sequence takes place in Tehran and is extremely well done, setting the stage for incisive commentary on today’s foreign policies and drone usage. Unfortunately, THAT movie never materializes, but we do get the over-the-top conservative news host … played colorfully by Samuel L Jackson, who does manage to work in his iconic catchphrase (yes even a PG-13 movie is allowed one MF). His holographic studio reminds of Minority Report, and has the futuristic look required to distract us from any real message. Joel Kinnaman (TV’s “The Killing“) adequately fills the part man/ part robot role (good guy and good cop Alex Murphy), but the script really lets him down when it comes to his wife (Abbie Cornish) and kid, his crime-fighting instincts, and the overlapping criminal elements – some poorly cast generic arms dealer and the ultimate villain known as mega corporation OmniCorp run by the great Michael Keaton. The movie’s best scenes involve the interaction between Keaton and the always terrific Gary Oldman, playing a conflicted doctor/robotics genius with a conscience (most of the time). The supporting cast is stellar and features a nasty Jackie-Earle Haley, a properly proper Jennifer Ehle, a relatively straight-laced Jay Baruchel, a two-faced police captain played by Marianne Jean-Baptiste, Murphy’s partner Michael K Williams, and Oldman’s loyal assistant played by Aimee Garcia (“Dexter“). The biggest missed opportunities involve the cop partnership with Mr. Williams … such an integral part of the first movie (Nancy Allen), but here it seems most of this story was inexplicably left on the editing floor. The story, the viewers and Mr. Williams deserved much better. A bit too much shakycam in the first shootout left me disappointed, as did most of the action sequences. However, the effects for the robotic suit and Murphy’s “body” are fantastic. Especially effective is the scene with Murphy first becomes aware of what remains of him and how much is robotic suit. This is very much a tale of moralistic choices, and it could have been interesting to see Murphy go a bit deeper in his existential questioning of Man or Machine. Mostly, I was simply relieved it wasn’t terrible and didn’t tarnish the legacy. **NOTE: the city of Detroit is the base, but the movie never really touches on the problems within the actual city. In fact, very little crime solving is shown – but we do have the stats relayed to us. SEE THIS MOVIE IF: you wonder what Iron Man would be like with an evil billionaire calling the shots rather than a brilliant billionaire wearing the suit OR you never miss the rare (these days) chance to see Michael Keaton on screen. 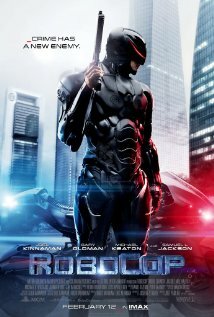 SKIP THIS MOVIE IF: you are perfectly content to allow the 1987 film version to maintain its spot as THE Robocop movie. This entry was posted on Friday, February 14th, 2014 at 9:26 am and is filed under Action, Fantasy, Sci-Fi. You can follow any responses to this entry through the RSS 2.0 feed. You can leave a response, or trackback from your own site.